Cost with Risks and uncertainties vs. Current schedule (budgeted) cost. 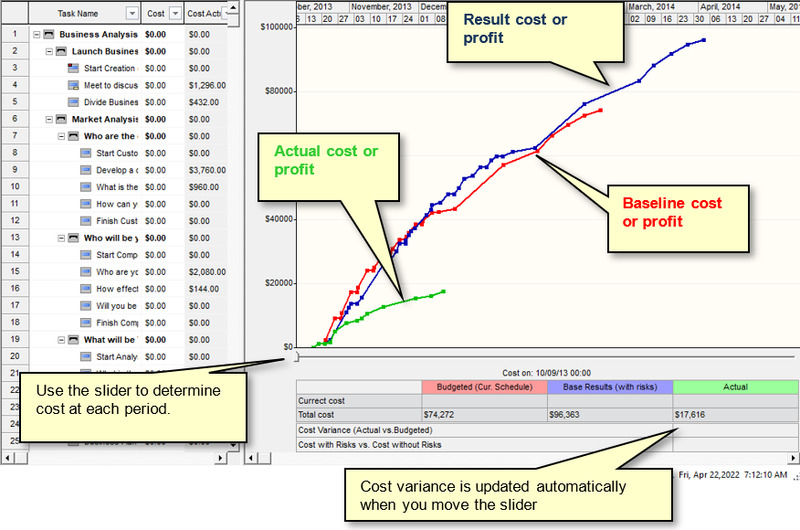 If income is defined for at least one task, the cost analysis diagram will show the project Profit calculated based on the formula: Profit = Income - Cost. If Cost exceeds Income in any given period of time Profit will be negative. If income is not defined, Cost will be always positive. Use the shortcut menu to modify the chart. In particular, instead of showing a line chart of current schedule, result, and actual cost, you can present an area chart by choosing Fill Chart from the shortcut menu.